The Wisconsin Department of Natural Resources (WDNR), under the direction of Governor Scott Walker, recently launched a five-year study on the effects of Chronic Wasting Disease (CWD) and predators on whitetail deer in the southwestern part of the state. The timing of the study is important as CWD is a prion-based disease that is always fatal to deer and remains a source of concern for wildlife officials across the continent. The WDNR says the study is designed to determine deer survival rates over a specified period for both infected and uninfected deer and determine whether the disease is the primary cause of death or merely a contributing factor. As noted in the study synopsis, CWD could be making deer more vulnerable to other sources of mortality (predation, vehicle collisions, hunting, etc.) because infected deer ultimately become less aware of their surroundings, less responsive to stimuli and less physically coordinated. According to the study’s first-year results, as reported by the Milwaukee Journal Sentinel on Feb. 28, deer with chronic wasting disease died at three times the rate of uninfected animals, amounting to a 75 percent annual mortality rate of CWD-positive deer compared to 25 percent in those without the disease. The WDNR attributed the higher mortality of CWD-positive deer directly and indirectly to the disease. Much of the study’s initial efforts has involved trapping deer and predators and placing telemetry collars on them to help identify patterns in movement, overall health, predator-prey interaction, habitat preferences and, ultimately, mortality causes. Trapping in the study area is primarily conducted during the winter months. So far biologists have captured and collared 268 deer, 21 bobcats, and 39 coyotes, though winter whitetail trapping is particularly labor intensive. At one time, darting the animals with tranquilizers was the standard procedure, but that is no longer the case. Fortunately, volunteer hunters, trappers and landowners continue to assist with the study. And now, with the second year of trapping underway, the Safari Club International (SCI) Wisconsin Chapter also is stepping in to assist. When the group heard about the study, Wisconsin chapter board member Dan Trawicki contacted the WDNR to ask how SCI could help. Conversation turned to the fact that while the drop nets are the preferred capture method, such nets are heavy and bulky, and it takes a team of field personnel to do the job. 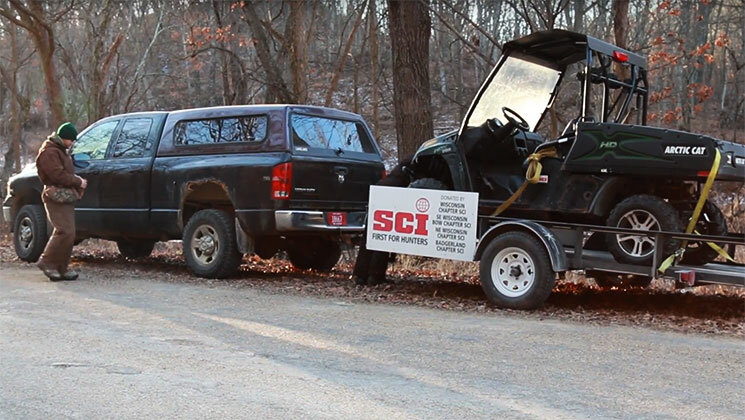 The SCI Wisconsin Chapter delivered two new Arctic Cat side-by-side UTVs earlier this year, which have been used almost continuously to haul crews and gear to the remote trapping sites. The WDNR is so appreciative of the donation that it produced a short YouTube video showing the vehicles in use. • Become a participating landowner within the study areas and allow field crews to capture and radio-collar deer and predators for research. • Volunteer to assist field crews with deer trapping (in the winter) and fawn capture (in the summer). • Report incidentally-caught bobcats and coyotes caught within the study area boundaries to research staff by calling 715-577-6288. • Become a Snapshot Wisconsin volunteer to help the WDNR monitor deer year round using a network of trail cameras, creating a unique opportunity for individuals, families and students to get involved. With all of the opportunities to help, no doubt hunters and trappers across the state will continue to lead the way in supporting Wisconsin’s wildlife conservation projects. For more information, please contact the WDNR research team at: DNRDeerResearch@wisconsin.gov.